http://www.harahanbridge.com/images/2.jpg This is how they used to build them... with a little style, a little classic layout that is lost on most things anymore. 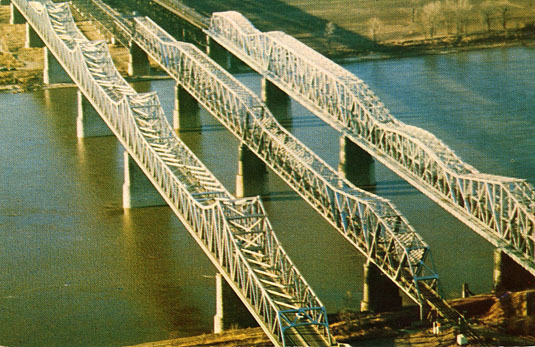 http://www.harahanbridge.com/images/2.jpg Before construction of the Memphis-Arkansas Bridge, this picture shows the two original crossings. |Frisco on left, Harahan on right http://www.harahanbridge.com/images/3.jpg |Memphis-Arkansas on left, Harahan on right and Frisco, center. Frisco on left, Harahan on right Memphis-Arkansas on left, Harahan on right and Frisco, center. Frisco on left, Harahan on right http://www.harahanbridge.com/images/3.jpg |Memphis-Arkansas on left, Harahan on right and Frisco, center. 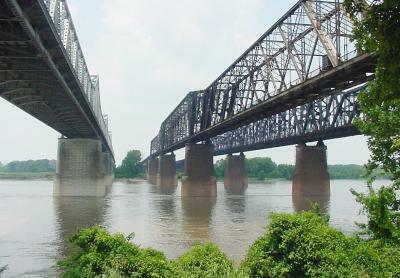 The Memphis-Arkansas bridge on the left, the Harahan Bridge right and the Frisco bridge, center. http://www.harahanbridge.com/images/3.jpg | The Memphis-Arkansas bridge on the left, the Harahan Bridge right and the Frisco bridge, center. Did you know that Memphis is home to four bridges that cross the Mississippi River into Arkansas, and that one of those bridges is over 100 years old? 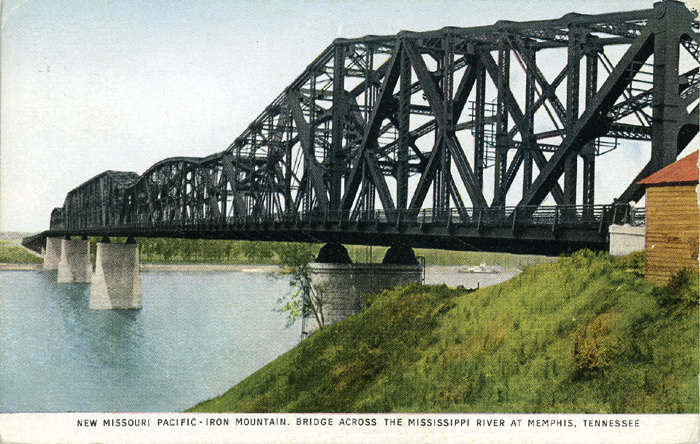 Four rail and highway bridges cross the Mississippi River at Memphis. They are, in order of their opening year: Frisco Bridge (1892), Harahan Bridge (1916), Memphis-Arkansas Memorial Bridge (1949) and the Hernando de Soto Bridge (1973). http://www.harahanbridge.com/images/8.jpg Built in 1892, the Frisco Bridge is still used for train traffic many times each day. This little noticed Memphis landmark is now 113 years old. The frisco bridge, the middle of the "trinity of bridges", built in 1892, is the first bridge built across the mississippi rivier south of St. Louis and was at that time the longest bridge in North America (all together..."oooooh, ahhhhhh"). 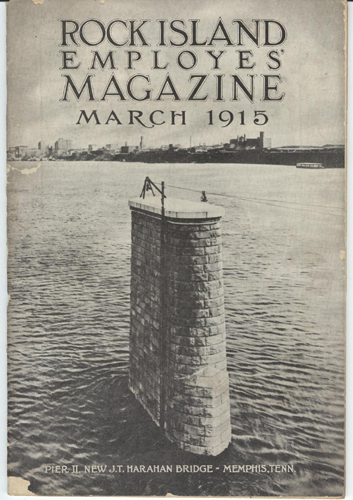 this bridge was originally known as the Great Bridge. this is a railroad bridge with cantilever trust steel structure that took about 4 years to build and designed by Geroge S. Morison who also designed other bridges which one is the taft bridge in washington, d.c. that crosses rock creek. http://www.harahanbridge.com/images/1.jpg Most drivers come across the "new" bridge, the Hernando Desote bridge and don't even notice the older spans a little further up river. This mess of concrete surrounding the Pyramid (yet another Memphis plan gone bad) are just feeders to the new bridge. http://www.harahanbridge.com/images/3.jpg The triple bridges that time time passed by - the Memphis-Arkansas bridge on the left, the Harahan Bridge right and the Frisco bridge, center. 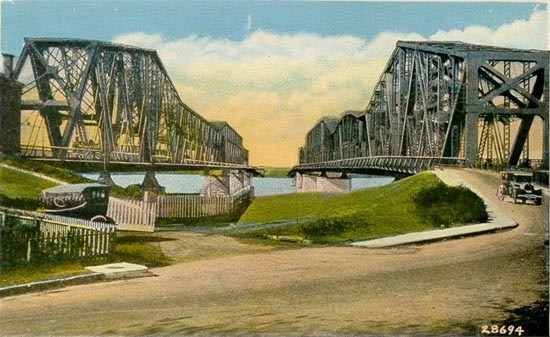 http://www.harahanbridge.com/images/9.jpg Built in 1916, the Harahan Bridge is still going strong as well. It is also used for train traffic. 23 men died in the construction of this bridge. Memphis is a city known for many things these days. Some good. Some not so good. Did you know that Memphis is homw to four bridges that cross the Mississippi River into Arkansas, and that one of those bridges is over 100 years old? Do you know your Memphis Bridges? The doors closed to the public for the last time on Christmas Eve 2003. The site has been completely demolished and now nothing remains but 90 acres of grass. The Malls website, www.mallofmemphis.com, is now owned by and directs you to Amazon.com - the virtual mall for the next 20 years, I guess. The MoM lived for a relatively short 22 years. Changing demographics, a murder in the parking lot and general crime in the area contributed to it's demise. This site is a Wiki - which means EVERYONE is free to add content to the site. Use the "EDIT" link at the bottom of each page to add your memories of The Mall of Memphis. I meant to go by and take some final shots of the mall, but never did so thanks Steven! Others were taken by Clinton and posted at http://homepage.mac.com/tby/PhotoAlbum5.html - thanks! Still more pics from thoughtcriminal at http://www.uer.ca/locations/show.asp?locid=20244 - thanks! Do you remember the Mall of Memphis? It's gone now - living on only here on the web.